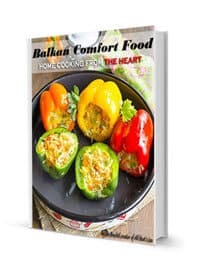 Looking for a quick and easy meal you can throw on a grill or in the oven that your whole family will love? 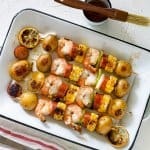 These grilled shrimp kebabs, aka low country boil, with potatoes, corn, and spicy sausage are as good for a weeknight supper as they are for a date night or a holiday celebration. Do you want to talk about an essential summer meal? Kebabs! I know there’s an entire demographic out there that strongly believes that all food tastes better on a stick. After trying this recipe, I’m sure you will agree with them too. Okay, so you don’t actually need to eat the food off of the stick when you make a kebab. More often than not, I see people slide the contents off over some rice or over a salad. 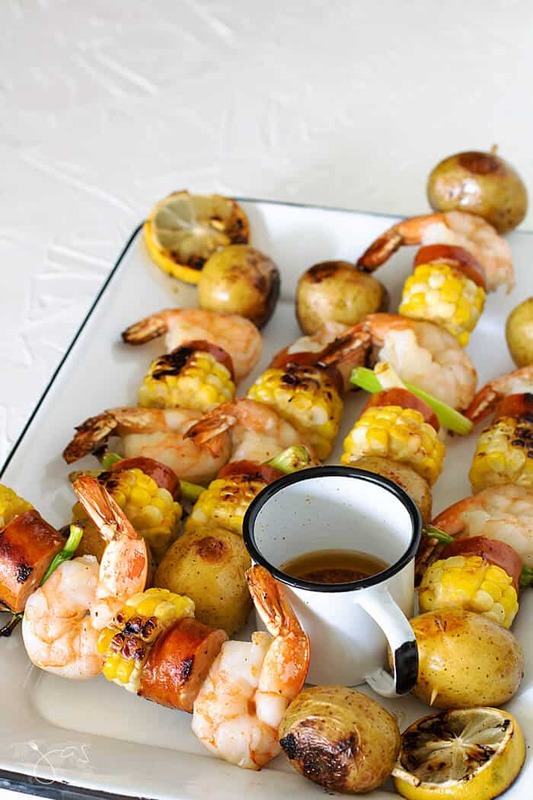 Thus, you can put all the ingredients in a foil packet and grill or bake in the oven which is a traditional Low Country Boil recipe. But it’s pretty fun to eat them off of the stick. So, if you’ve seen my recipes for lemon-garlic shrimp linguine or shrimp risotto, you’ve seen me rave about shrimp and why you should be including it in your regular diet and on your menu (and ignore the fact that I’m not a big fan of them, ha!). For starters, shrimp is very easy seafood to cook, as it has an obvious visual indicator and is usually done in a couple minutes. That being said, you do need to keep a close eye on shrimp while they’re cooking, because your window between perfectly cooked and overdone is small. Second, you can prepare shrimp in endless ways! Shrimp with blackened seasoning, Cajun seasoning, lemon pepper… the list goes on. Once you pick your flavors, you can grill them, coat and fry them, sear them, or cook them in a number of ways. I could never get tired of cooking shrimp with all I can create with it, to utter delight of my husband. For this particular recipe, we’re going to season our shrimp with Old Bay (any readers from Maryland out there?) and then, of course, place them on the grill. The third reason you should incorporate shrimp into your diet regularly is that shrimp is so darn good for you. For every 3.5-ounce serving, you get 24 grams of protein, and nutrients such as selenium, vitamin b12, and antioxidants. Shrimp are also incredibly low in fat, so they’re basically a body builder’s dream. Due to globalization and transliteration, there’s a subtle shift from kebab to kabob. Kabob is the US spelling of Arabic kebab or Turkish kebap, so all three have the same meaning – grilled meat dishes often cooked on skewers. So, I first came upon this recipe a while back when it was my husband’s birthday weekend. I told him that he could pick anything he wanted for dinner, and I would happily make it for him. His first choice was lobster, and I took my offer back. Putting a lobster in boiling water was not going to be my job. His second choice was shrimp, but not just any shrimp. If that had been the case, I would have whipped up any of the several shrimp dishes on my menu. However, today my husband requested, “Shrimp with other things on skewers.” I love how blunt and straightforward that was. SHRIMP KEBABS, my love, shrimp kebabs. I had a whole mix of other things on those kebabs: sausage, corn, and potatoes, all the ingredients for the low country shrimp boil. You have your protein, vegetable, and carbs, seasoned and grilled… on a stick. A whole meal! 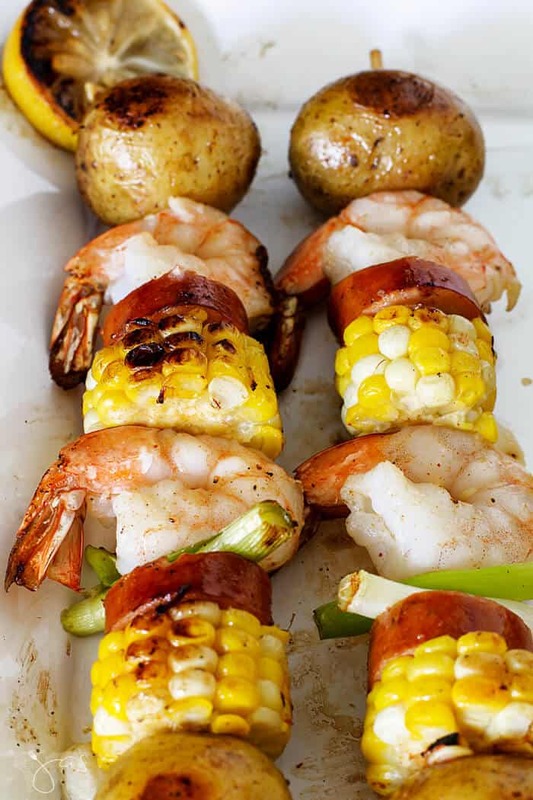 Plus, grilled shrimp, sausage, and corn will make it feel like summertime any time of year. Trust me, when you live up North, you need a meal that makes it feel a little sunny and warm. What kind of food do you like to put on a stick and grill? If you’re like me and don’t like shrimp, this is still a wonderful recipe for you. I just slide over shrimp to my husband’s plate and I enjoy everything else. It’s like two meals in one. 🙂 Serve it with fresh garden salad or salsa, like Texas cowboy caviar. If you can’t find andouille sausages, use any smoked sausage or kielbasa you have available. Do not use pre-cooked shrimp, it will turn into rubber! If the shrimp are frozen, defrost them first. If you’re using wooden skewers, soak them in water for a minimum of 30 minutes before using them so you don’t lose part of skewers to the flames. Boil potatoes in salted water for about 10-12 minutes. Add the corn in the last 5 minutes. Not only it is easier to get them onto skewers (I recommend using the metal ones, but if you’re using the wooden skewers, this step is even more important) but the cooking time differs and you don’t want undercooked corn. Rinse with cold water. Cut corn into 1 ½ inch rounds. 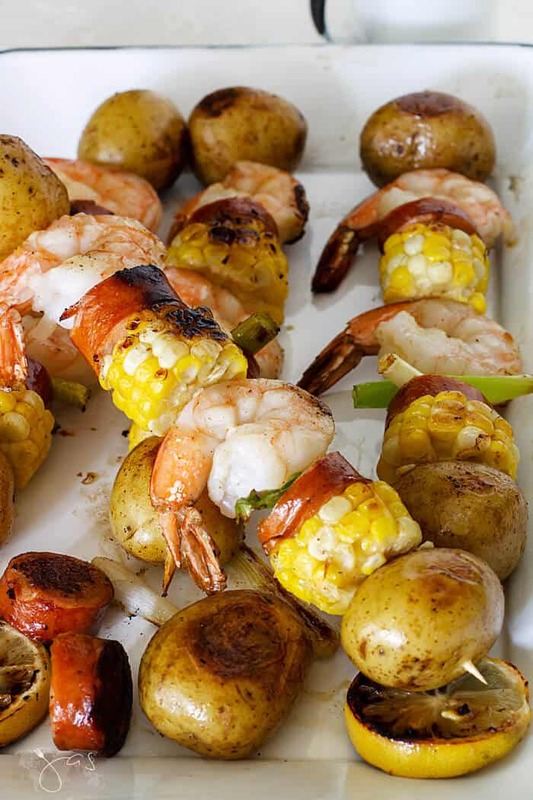 Thread potatoes, corn, shrimp, and sausage, and green onions onto skewers. Lightly oil grill (an indoor griddle works well too) and heat to medium-high. Melt the butter and combine with Tabasco and Old Bay seasoning. Grill kebabs brushing with butter mixture occasionally and turning until the shrimp are cooked through about 8-10 minutes. 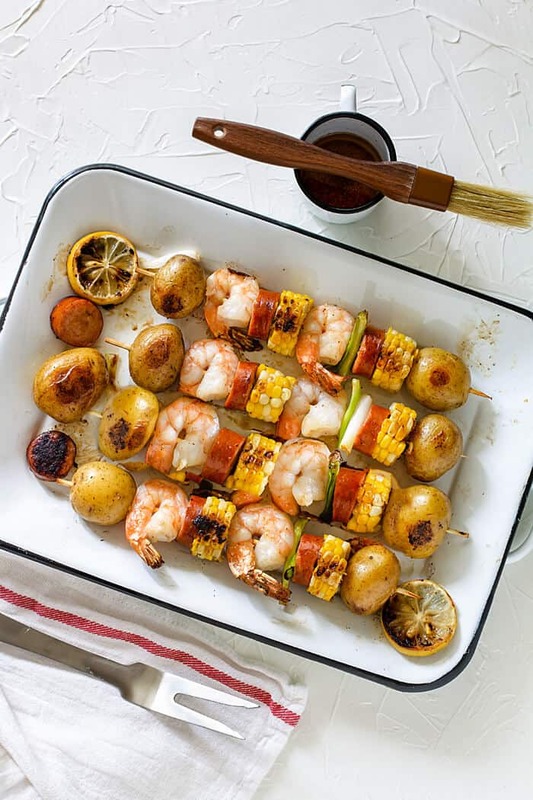 Grilled shrimp kebabs, aka low country boil, are easy and as good for a weeknight supper as they are for a date night or a holiday celebration. Boil potatoes in salted water for about 12-15 minutes. Add the corn in the last 5 minutes. Not only it is easier to get them onto skewers (I recommend using the metal ones, but if you’re using the wooden skewers, this step is even more important) but the cooking time differs and you don’t want undercooked corn. Rinse with cold water. If you're using wooden skewers, soak them in water for a minimum of 30 minutes before using them so you don't lose part of skewers to the flames. Perfect for Labor Day weekend! & looks so good. Thanks for sharing at the Inspiration Spotlight @DearCreatives pinned and sharing. Thank you much, Theresa! Enjoy your holiday weekend! A perfect dish for a get together! It looks delicious, Jas! Thank you for sharing with us over at Fiesta Friday! Food on a stick is always so much fun! Your Grilled Shrimp Kebabs look amazing, Jas. I would definitely enjoy these for a birthday meal. 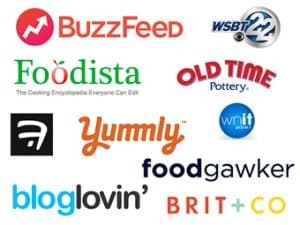 Thank you so much for sharing, and for being a part of the Hearth and Soul Link Party. Sharing around! Have a great week! Living in Florida where it is grill season most of the year, I can see myself making these often. Lucky you! We’ve grilled a few times while it snowed but it’s not fun, lol. Enjoy your week. Thank you Jas, I hope you are having better weather for this holiday weekend than we are. Lots of rain from a tropical depression so no grilling being done here. Oh, no! Stay dry. Our temps are in upper 80’s with little to no rain but lots of humidity. These look delicious! I am always looking for new grilling recipes, and I can hardly wait to try these! 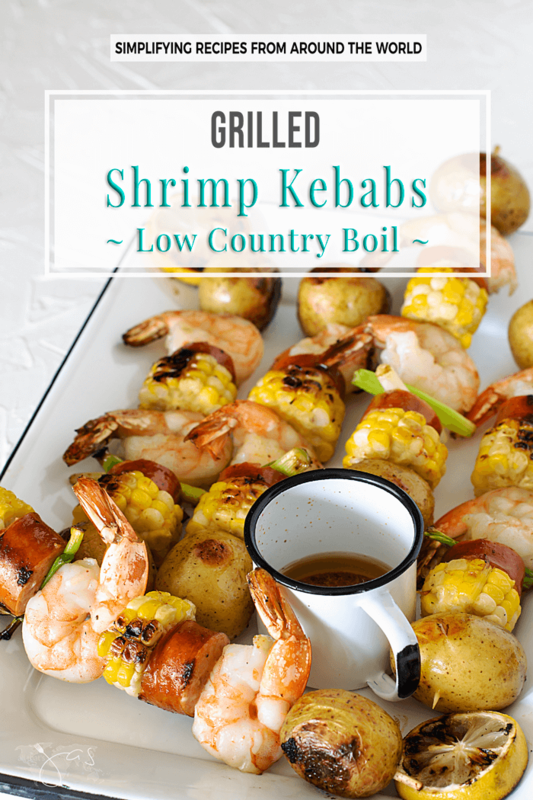 I love your presentation for this low country boil shrimp kebabs. These kebabs will be a big hit with here! 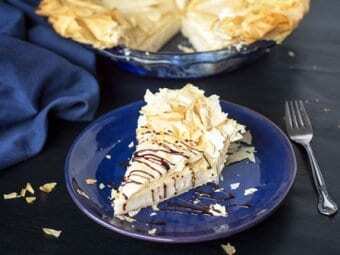 Thanks so much for sharing with us on Full Plate Thursday and have a great weekend! Thanks, Miz Helen! Your kind comment means a lot! oh yum! 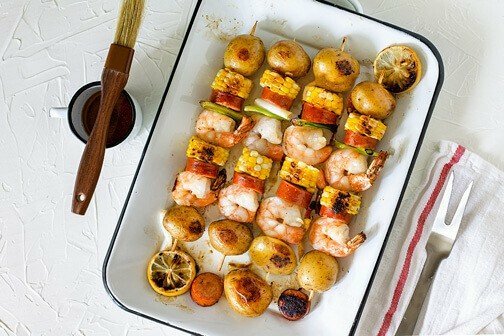 I love kabobs, and shrimp are my favorite! Thanks for sharing the recipe with SYC. These look delish! Such a good idea for a barbecue or back to school party! Thank you, Jodie! Have a great week.